Dr Gilbert Price is a vertebrate palaeontologist with interests in the evolution and emergence of Australia’s unique ecosystems and fauna, and their response to prehistoric climatic changes. His major research focus has been on the development of well-dated extinction models for Australia’s Pleistocene megafauna. Gilbert was named the Queensland Young Tall Poppy Scientist of the Year in 2013. 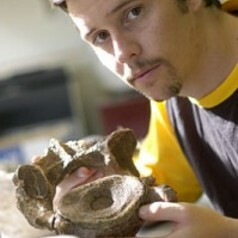 He is an active science communicator and blogs regularly on his personal research website www.diprotodon.com.